The wind tunnel at the University of Southampton is used by many outside individuals and organisations, as well as the students themselves. The majority of the athletes winning gold medals in the Beijing Olympics had used the wind tunnel for refining their equipment and posture. Unfortunately, the tunnel is housed in an industrial shed and it is accessed through a maze of corridors. 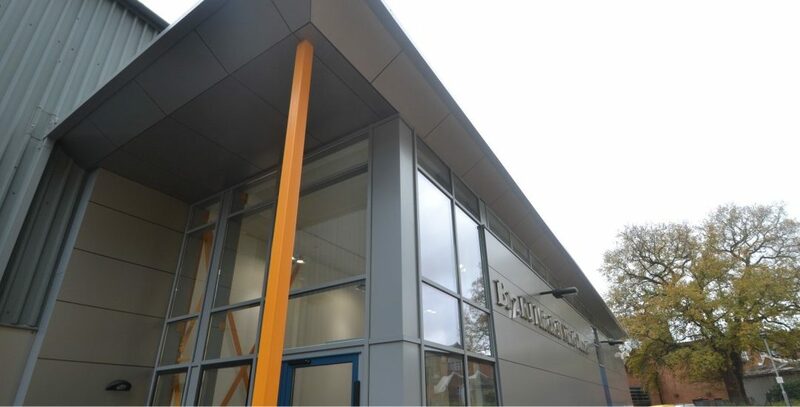 We were approached to design a new entrance which would raise the profile of the building, create a viewing gallery onto the running bed and providing more appropriate changing facilities, all within the width of the footpath. We have designed a simple steel framed box with curtain wall and aluminium rainscreen cladding. A two storey reception space will allow for past models to be hung from the ceiling. Also on the ground floor there is a toilet, kitchette and office. Upstairs leads in to the wind tunnel building and the viewing gallery, with a parallel entrance for athletes from the changing and shower rooms. The University required an additional six Reading Rooms for the existing Library. Studio Four undertook a Feasibility Study and investigated various options and locations. The proposed development will provide the additional space required, as well as a separate functional area which can be isolated from the existing refectory creating a more versatile space. This project was commissioned as part of the Southern Universities Affinity Group framework. Studio Four were appointed to redesign the external elements of an existing building on campus. The wind tunnel at the University of Southampton is used by many outside individuals and organisations, as well as the students themselves. The University of Winchester appointed Studio Four Architects to carry out a feasibility study for enclosing an existing courtyard to create a new Senior Common Room. This Hospital Campus project follows on from the success of the Somer Cancer Sciences Building. Studio four carried out extensive refurbishment works to the Photo Media Suite at the Winchester School of Art during the summer holiday period. The College wished to replace all their temporary teaching accommodation with a single Teaching Block of 1800sq.m, including Laboratory and Lecture Theatre facilities.